You may not have heard of Cranes, but I have a feeling their name will become a familiar one in the not too distant future. 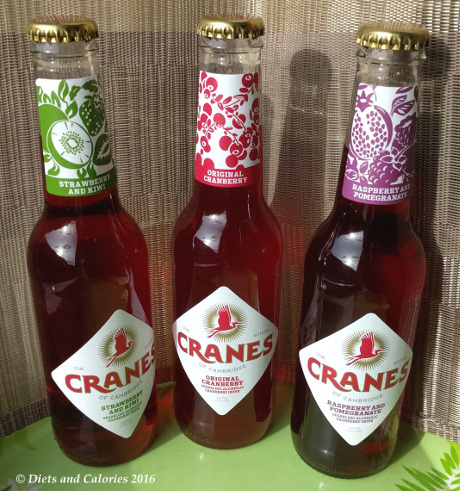 Cranes is the world’s first premium cranberry ‘cider’ which is made from fermented cranberries. At the time of writing there are three varieties: Original Cranberry; Raspberry & Pomegranate and Strawberry & Kiwi. 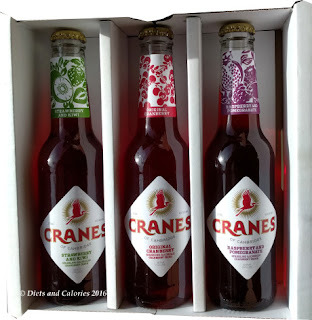 Cranes Cranberry ciders are 4% alcohol and sold in 275ml bottles. Each bottle has just 99 calories, around half the calories of wine! Cranes Cranberry Cider drinks were developed by Ben and Dan, somewhat health conscious identical twins, who wondered what would happen if you fermented cranberries. As you do! So they had a go and came up with a unique, refreshing and reasonably low calorie alcoholic drink. Cranberries serve as the base for the different varieties with raspberries, pomegranates, strawberries and kiwi fruits added to make the other flavours. ‘Lightly sparkling premium alcoholic cranberry drink fermented from crushed cranberries, blended with concentrated juices (16.5%) of raspberry and pomegranate, with sweetener’. 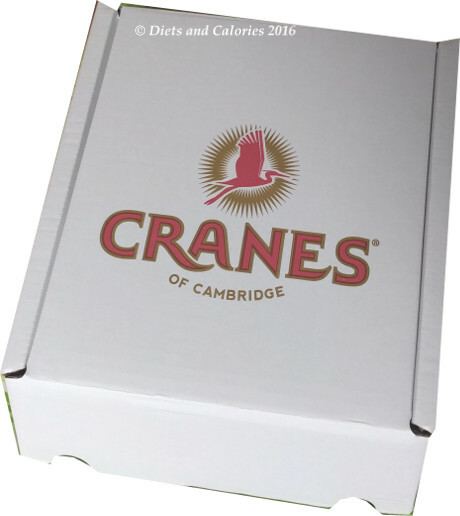 Cranes contains no artificial flavours, colours, or preservatives so the rich colours come from the fruits. Cranes is unique – the alcohol comes purely from brewed crushed cranberries (cider comes from apples), and the flavours are enriched with the juice of the fruits. Each bottle is equivalent to 1.1 alcohol unit. Although not much of a drinker, I took delivery of three sample bottles of Cranes Cranberry Cider to try out. As advised, I chilled the bottles first and started with Raspberry and Pomegrante Cranberry drink. I don’t like fizzy drinks so was a bit worried about the sparkling aspect. However, it’s only very slightly sparkling which didn’t detract from the taste which, by the way is… absolutely delicious. It’s sweet, but not too sweet. There’s a delicate fruity taste of the berries and it’s so refreshing. What made it really drinkable for me, was that I couldn’t detect the alcohol! It tastes just like a berry fruit drink and is incredibly easy to drink. I felt the same about the Strawberry and Kiwi drink too. However, when it came to the straight Cranberry Cider, there was definitely a stronger alcoholic taste, although all three flavours are 4% alcohol. I only drank some and gave the rest to hubby, the alcohol expert in my family, who agreed they are delicious and very easy to drink. At the time of writing, Cranes Cranberry ciders are available in Ocado online or at: shop.drinkcranes.co.uk.